1. A showy display, as of wealth, knowledge, etc. ; pretentiousness: Art was trying to impress the girl at his school with the ostentation that he knew all of the answers to the homework assignment that the teacher had given them for the test on the following day. 2. 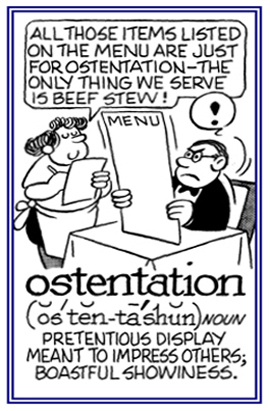 Etymology: from Latin ostentation-; from the verb ostentare, "to frequent" of ostendere "to stretch out to view". © ALL rights are reserved. An excessive population of an area to the point of overcrowding with a depletion of natural resources, or environmental deterioration. A saturation of or a combination with oxygen, as with the aeration of the blood in the lungs. The treatment or combination of a substance or compound with ozone. 1. The use of ozone in the purification and deodorization of air and water. 2. The process of treating, impregnating, or combining with ozone. 1. Policies taken by a government to defeat an insurgency. 2. The act of appeasing someone or causing someone to be more favorably inclined to cooperate or participate in a peaceful action. 3. The procedure of making people calm when they are angry or upset. 1. A simple technique in which a doctor presses lightly on the surface of the body to feel the organs or tissues underneath: Mary's physician was using palpation in order to determine if her kidney had enlarged or if there were any tumors and to make sure that her condition was normal or needed medical care. 2. An examination by touching or manipulating a section of the body with the hands or fingers in order to ascertain its condition for medical diagnosis: Dr. Brown was feeling Joe's pulse beat to determine if his palpation was normal. 3. Etymology: from Latin palpationem, "stroking"; from palpare, "to touch gently". Infection or infestation with a parasite or parasites. Etymology: from Late Latin participationem, participatio, a noun of action from the stem of Latin participare, "participate"; from particeps, participis, "partaker"' from pars, partis, "part" + -cip-, a form of the stem capere, "to take". 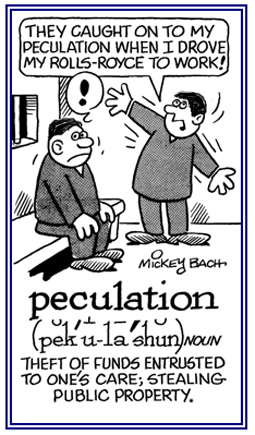 A depraved, dishonorable, or immoral act: Once in awhile, there have been reports about adults, including teachers and religious leaders, who have committed peccations with minors. In geology, the processes involved in the formation and development of a pediplane or pediplanes. Any of the various processes by which the surface of the soil is disturbed; such as, the burrowing of animals like rabbits, moles, etc. Showing page 70 out of 96 pages of 1437 main-word entries or main-word-entry groups.